This Guest Post is brought to you by Dr. Charles Flagg, on behalf of Save the Great South Bay, and does not necessarily reflect the views & opinions of LongIsland.com and its staff. 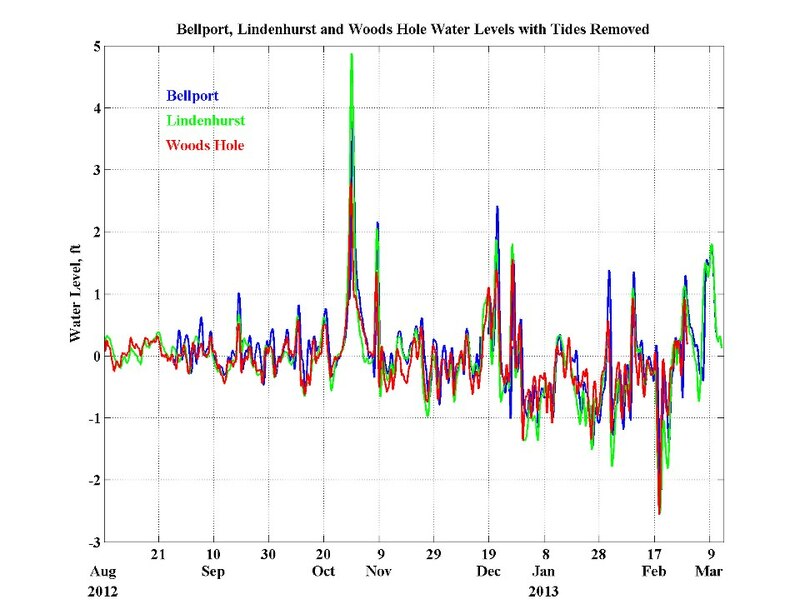 Because of all the excitement caused by last weekend's high waters, I have examined the water level record from Lindenhurst and compared that with the records from Bellport and Wood Hole. Woods Hole is included because it is completely in another coastal region. Below are two figures. The first shows the de-tided records from the three stations and like the plot I sent out yesterday. It is clear that these high and low water periods have been felt all along the coast. Sometimes Bellport gets more water than Lindenhurst and sometimes the opposite happens. Those are small local effects that depend upon wind direction. Categorically, the large water level excursions have nothing to do with the breach at Old Inlet. 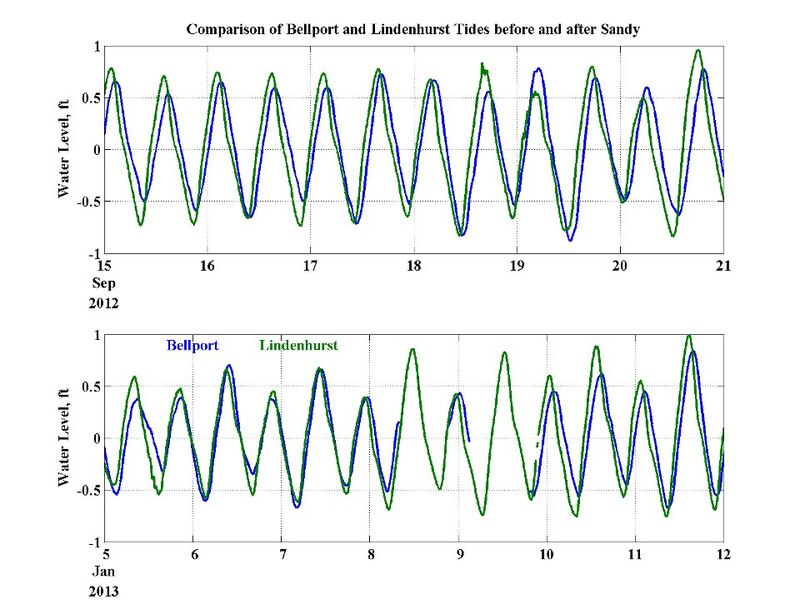 I then compared the tide records at Bellport and Lindenhurst before and after the hurricane and those plots are shown in the second figure. The tidal amplitudes have not changed as a result of the breach. So again the breach does not appear to have altered conditions within the Bay. I completely understand the horror of watching the waters creep up towards ones house but it does not help the situation to insist upon closing the breach when it is clear that it is not to blame and there are clear water quality benefits to leaving it open. 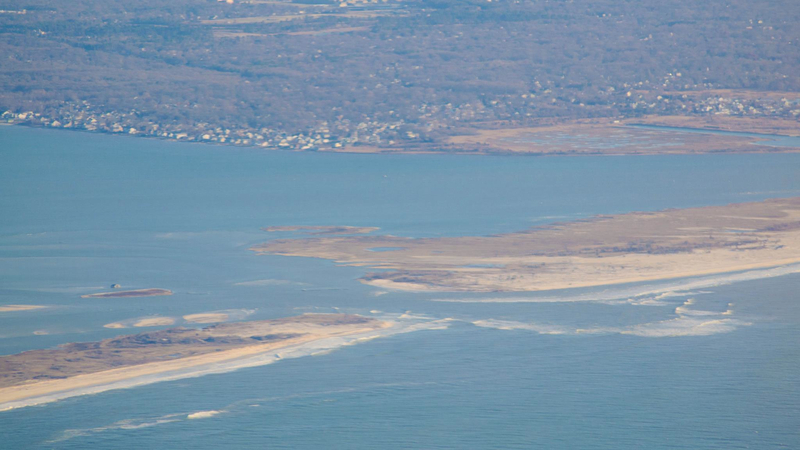 Dr. Charles Flagg of Stony Brook's School of Marine and Atmospheric Sciences has been monitoring the breach at The Old Inlet on The Great South Bay since Sandy and has yet to see any evidence that the breach is contributing to flooding on The South Shore. Photo of the Great South Bay Taken By Michael Busch. Save The Great South Bay was formed last August at a 35th Sayville High School Reunion, where the attendees shared their shock and dismay at what the bay had become. They determined that The Great South Bay had to be revitalized so that our children and grandchildren could swim, boat, clam and fish there. Save the Great South Bay has over 500 members since Jan 1st and has enlisted a number of local baymen and marine scientists studying the bay to the cause. It promotes new technologies, green practices and policies for healing the bay, our ponds, rivers and streams. It is a place where all those who love The Great South Bay and The South Shore can gather together to build a healthy, sustainable bay. To learn more, visit their website, "Like" the Facebook Page, join their Facebook Group, or follow Save the Great South Bay on Twitter. To view their latest photos, check out the Save the Great South Bay Photo Album. Subject: LongIsland.com - Your Name sent you Article details of "The Flooding is Up & Down The East Coast - The Breach at The Old Inlet Is Not Contributing To It"